The Lessard property, located approximately 107 kilometres north of the town of Chibougamau in the province of Quebec, comprises 109 claims for 2,168 hectares. Lessard hosts a copper-zinc-silver deposit with a historic resource reported in a feasibility study in 1975 by Selco Mining Corporation Ltd. In September 2008, a resource estimate compliant to NI 43-101 was completed on the Lessard deposit. The resource estimate reported 740,000 tonnes at 1.88 per cent. Cu, 3.50 per cent. Zn, 38.62 g/t silver and 0.84 g/t gold using an NSR value of US$206.52. All of the resource is in the Inferred category. The Lessard deposit remains open down dip. During Q3 to Q4 2011, a field reconnaissance, mapping and sampling campaign was carried out on the Lessard property. This exploration programme outlined prospective targets for copper and zinc, as well as identified the potential for silver and gold mineralisation. Geological mapping investigated surficial exposures of geophysical anomalies, as well as targeting potential base metals hosted in several lithologies. Highlights of grab rock sampling include 0.69 per cent. Cu and 0.32g/t Au yielded from a fine grained, silicified intermediate volcanic rock. 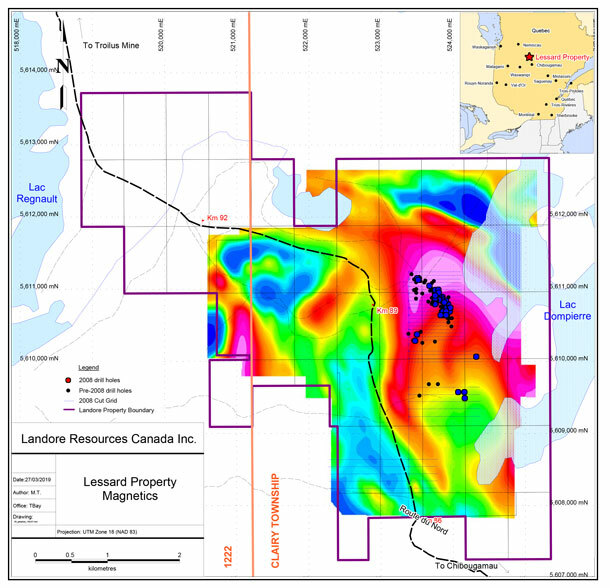 This and other encouraging mineralisation was revealed through the 2011 field investigations, and several areas of interest on the property were identified for follow-up exploration. Click to download the NI 43-101 Technical Report on the Lessard Project.